I gotta hand it to that surly gentleman who works behind the Persian food counter at Wholesome Choice in Irvine. His grimace is unflappable. His brow is forever furrowed. It actually seems like he's making a concerted effort to avoid eye contact with anyone or anything. As he scribbled my order for a Chicken Koobideh ($6.99), his death stare was focused somewhere over my shoulder, at nothing in particular. A mischievious side of me wanted to re-enact a certain scene from Seinfeld. Has anyone ever told you that you look exactly like Al Pacino? You know, “Scent Of A Woman.” Who-ah! Who-ah! But I knew better than to piss-off a guy who has a stash of long metal skewers within reach of his burly, hairy arms. And a grump is better than a Soup Nazi. So I took the stub of paper with the order number from his grip and quietly stood aside. I watched and waited as his co-worker took out two more swords from the fridge, its blades packed with ground meat, which he placed over an open pit of fire. As I counted the minutes until my dinner was ready, I surveyed the rest of this food court within a store. There's an Italian stall with fresh pizzas and pasta across from me. 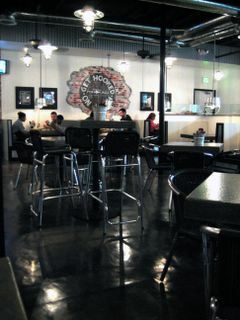 Next to it, Mexican food and American home-style. On the opposite side of the same island, Indian and Chinese. And when you're not feeling peckish for the cooked flesh of landborne animals, there's both a salad and sushi bar towards the back. It's quite literally, a trip around the world in less than forty footsteps. It wasn't long ago when Wholesome Choice was a Whole Foods Market, and before that, during my undergraduate years at UCI, it was a Ralphs. Of all the things in Irvine that has changed for the better over the years, I think Wholesome Choice is at the top of that list. 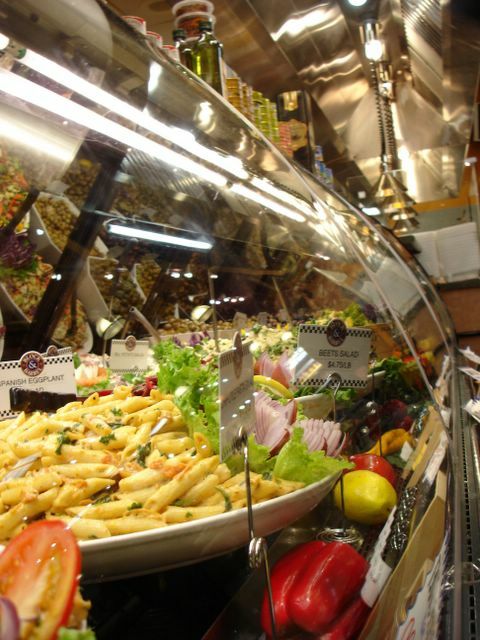 An international supermarket with a Middle Eastern accent, it has sparkling aisles and boasts unique products the Whole Foods/Trader Joe's demographic craves, while still pleasing the traditional Persian tastes of its core customer base. 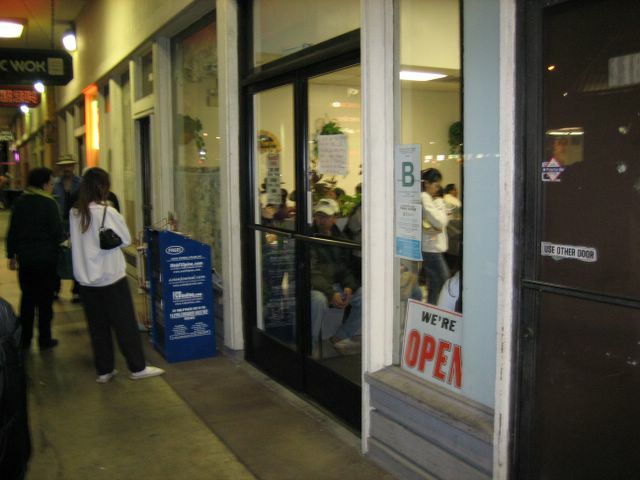 A prime example of this is their offering of sangak, a Persian seeded flatbread baked hourly, and doled out hot and fresh from a hearthstone oven to an eager line of customers. The other staple of the store was this Persian food counter, where The Grump works. 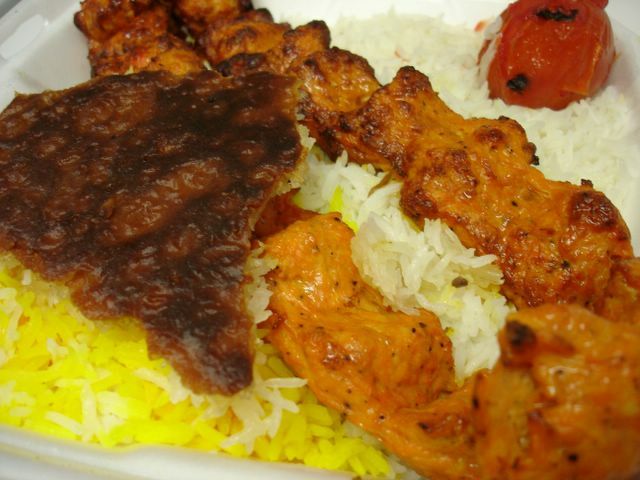 Along with the koobideh I ordered, there are shish kabobs, chicken barg, Persian salads, and even colorful stews ready and waiting in steam trays. But the koobideh is the reason I come to Wholesome Choice. I leered hungrily as my koobideh took on a burnished orange color and a little bit of char. 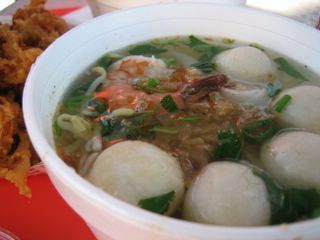 Noticing the ravenous glint in my eye, The Grump's co-worker slid it off the skewer into a waiting styrofoam box of rice. From another spit, he extracted one grilled tomato from a dozen others which were strung together like a gigantic fruit necklace, and off it went on top of the mound, along with a crusty piece of burnt rice. The Grump took the container from him and pushed it towards me on the counter. He tossed on top of it, a plastic bag with half an onion, a wedge of lemon, and butter. When I noticed that the onion I got was discolored, I meekly asked if I could exchange it. Without a word, he took back the one he gave me and tossed me two new bags. This was his way of saying, "You think I care about the onions!? Take two! Take as many as you want!" I thanked him profusely and went home to enjoy my dinner (which coincidentally was enough for two). When I got home, I tore open a packet of sumac, a spice that looks like red dandruff with a citrusy tang, and sprinkled it all over the rice. 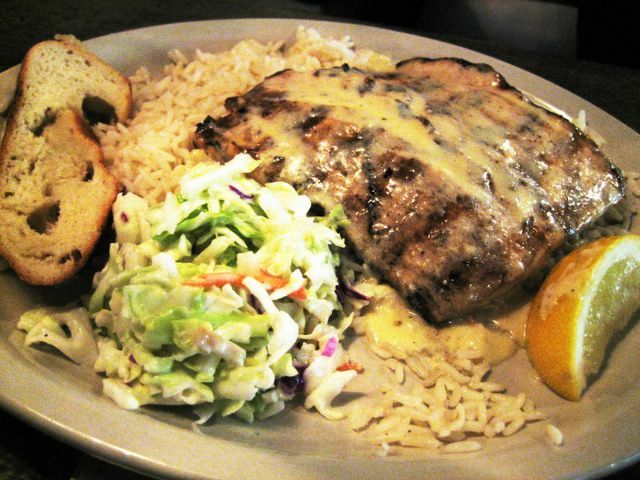 After a drizzle of lemon juice went on the glistening lobes of the chicken koobideh, we were ready to eat. The loose grains of basmati were nutty and fragrant, with a sunny streak of yellow rice running down the middle. The koobideh, made from a mixture of egg, ground chicken and turmeric was firm to the touch but tender to the teeth. The grilled tomato was promptly squished and torn apart with a fork. We used its pulp and juices to moisten the rice. And each time I took a spoonful of rice and meat, I peeled off a layer of the raw onion and chomped on it. It's both refreshing and spicy. But the plank of crunchy burnt rice, I ate sparingly. Although it provided a satisfying textural contrast to the meal, it was too jarring and tough to eat for an extended period of time. With food like this, how can anyone stay grumpy. I've written about this restaurant before. 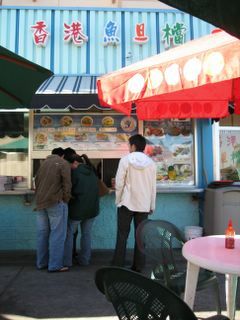 And as I've said in the earlier post, it's not to be confused with the Chinese take-out chain of the same name. 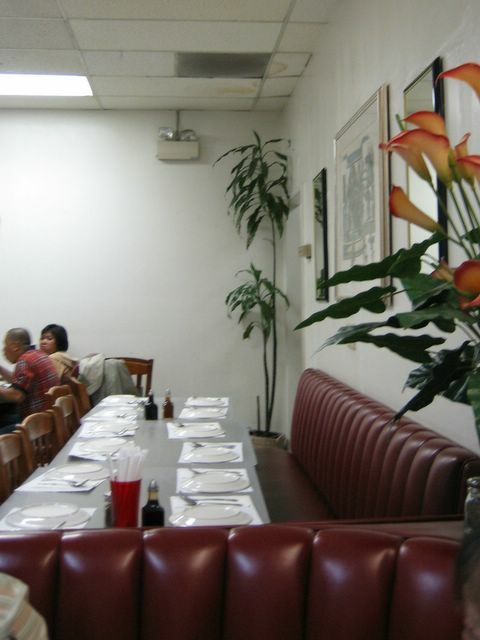 This place serves up Filipino food. Great Filipino food. In fact, not only is it my favorite place for enjoying the cuisine of the Philippines, it's on my short list of all-time favorite restaurants. Period. It's owned by a motherly Filipina with a jolly face who always welcomes us warmly and dotes on us as if we were her own children. Nevermind the stains on the ceiling tiles. Forgive the framed pictures perennially hung askew on the bare walls. Yes, her space is spare and the potted plants are plastic, but there's nothing fake about her food and hospitality. Here, it's all about substance, not style. The food is the real deal; honest, home-style Filipino cooking done right by people who take a lot of pride in the cuisine, and with prices so low, it's almost criminal not to leave an overly generous tip. 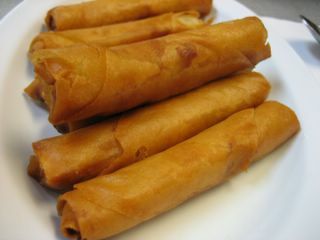 We started with Lumpia Shanghai, which were egg rolls, pure and simple. But instead of being fat and bulky like the Chinese variety, it's long and slender, like a taquito. Each bite gave up equal amounts of the thin, crunchy shell and that savory pork filling in a perfect balance of textures. I took them for a dunk in banana ketchup, a candy sweet concoction that comes in a bottle, and was in for a new addiction. The next dish we ordered is both ingenius and insane. What else can I say about what is essentially pork fat, deep fried in...pork fat! Depending on how one looks at it, it's either a cardiologist's worst nightmare or fondest dream come true. I can feel my chest tightening up and hear my arteries hardening just at the thought of it. It's called Lechon Kawale. What is it? Answer: deep fried pork belly. Yes, you read that right. 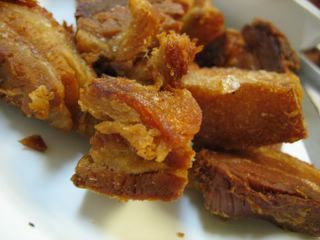 Nuggets of unsliced, uncured bacon, is first boiled in a spiced brine, and then cooked in boiling fat until the meat is crackly brown and the rind puffs up like a chicaron. Each golden chunk possessed a crust that has an ungodly crunch, leading to salty crisped shards of pork, and a mushy layer of fat which felt like custard pudding except ten times as unhealthy. It's crunchy, sticky, salty, sweet, rich and decadent, while still being humbly simple. As my eyes glazed over and my lips became greasy slick, my brain calculated how many slices of bacon each small piece equates to. The answer? About three. 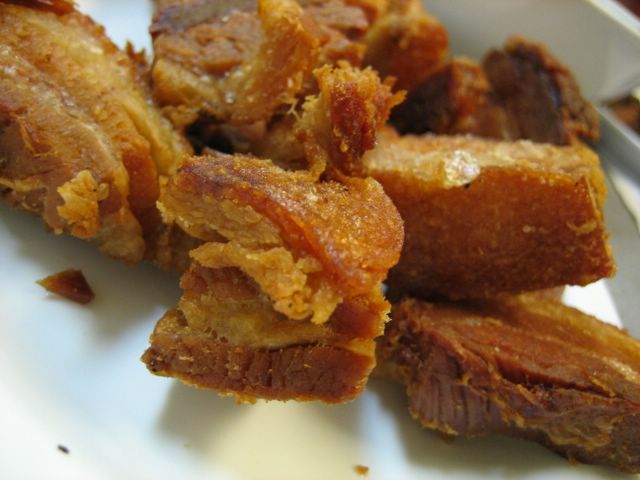 I consumed about five morsels of the lechon kawale that night. I'll let you do the math. Hyperbolic descriptions aside, it's a great dish, but one that you cannot eat by itself. 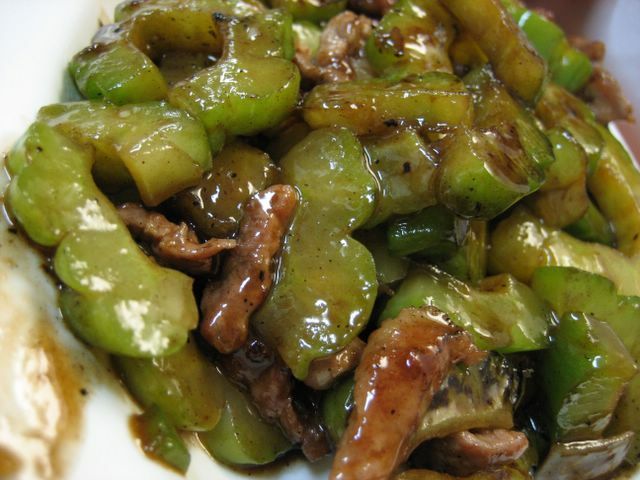 To offset the pork fat assault, we ate Ampalaya (bittermelon), stir fried with, of course, pork. But small, lean bits of it this time. The star of the plate, however, was the bittermelon, and it is true to its name. For those uninitiated to this humble Asian gourd, brace yourself. Its chemical bitterness is the ultimate of all the acquired tastes. Think of radicchio after a good soak in lye soap, and ratchet it up a few notches. That's bittermelon. To say that it cleanses the palate is not enough. It's shock therapy for the taste buds. With a mouth-filling acridity that is oddly pleasant and off-putting at the same time, you wonder if the enjoyment comes from the sense of achievement one gets after being able to stand the flavor. The bitter taste is obviously the plant's self-defense mechanism trying to fight back. Amateurs cooking this lethal melon would not know how to properly temper the bitterness. Eat a wrongly prepped bittermelon and you're liable to keel over, eyes winced, face all puckered. We took comfort in knowing that Magic Wok's cooks prepared the gourd with a deft hand and a hot wok. Along with taming this beastly veggie's bitter bite, the wok gods of the kitchen have also blessed the dish with the unmistakable smoky aroma of wok hey, a key flavor which only adds to its appeal. 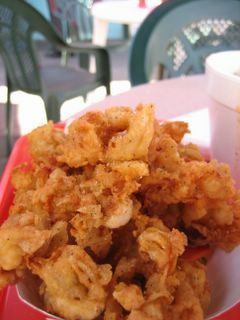 Next up was Calamares Prito, which were calamari rings, deep fried with a dense and crunchy coating of seasoned crumbs. Those dark granules of breading, which were caked onto the squid rings, delivered with each teeth-rattling bite, a concentrated flavor of garlic, salt, and spice. Roughly cut green onions garnished the top, adding a splash of color and a grassy fresh, herby note. I drizzled a few drops of the garlic vinegar which is served along side and achieved levels of greatness never reached before by a plate of fried squid. 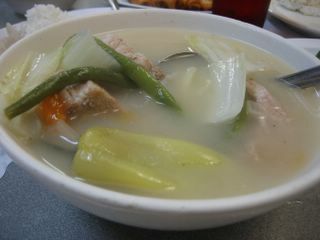 No meal at Magic Wok would be complete without a bowl of the sour pork soup called Sinigang na Baboy. 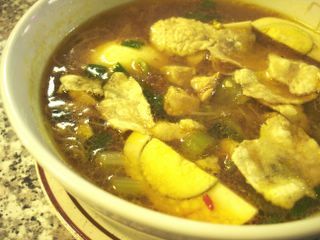 This is a soup so zingy and tart that it wiped the palate clean of the grease left behind from the fried entrees. The murky white broth, culled from simmered pork meat and bones, is punched up with tamarind pulp and citrus juice. A few cuts of daikon, green beans, onions, and other fresh vegetables are simmered in the soup along with hunks of tender pork riblets still on the bone. 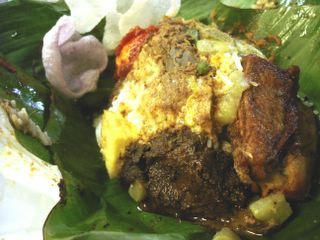 Customarily, you consume this dish by dousing your rice with a spoonful of the soup and then dribble some patis (a pungent and salty fish sauce) onto the boiled meat before eating. I did this, but found that just sipping the soup straight up worked just as well. 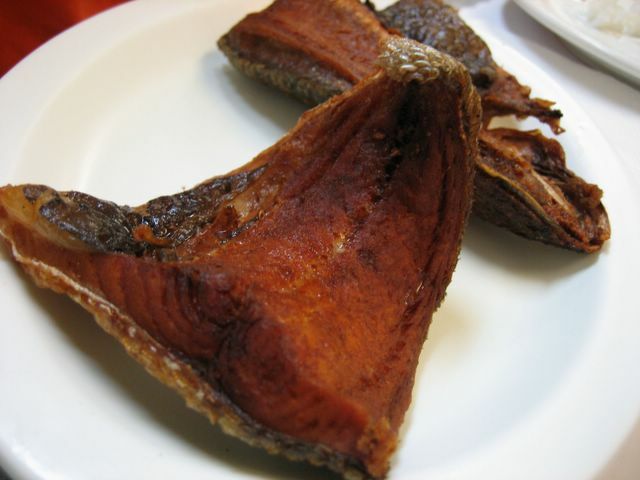 Daing na Bangus is milkfish tail brined in salt, soy and spices. It's rigorously boiled in this seasoned brew inside a pressure cooker to render the species' many combs of tiny bones brittle and edible. 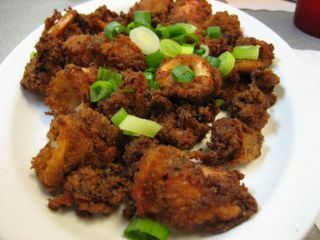 Then, just prior to serving, it's dropped into hot, bubbling oil and cooked until the outside is crunchy and mahogany brown. It arrived at our table with the tail curled up gracefully, like a snapshot of Flipper the dolphin, frozen in mid-jump. As I dug in, I am reminded of how milkfish (bangus) was the staple of my childhood diet in Indonesia. It's a fish best suited for eating with a plate of hot steamed rice since the meat has a boldness that's perfect when paired with neutral side dishes. 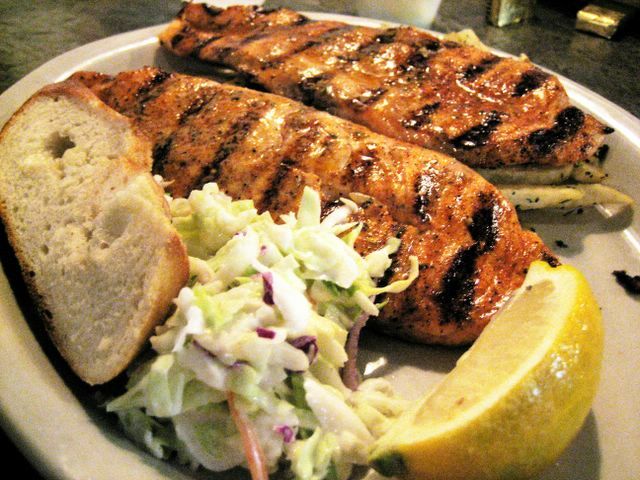 Its robust flavor puts to shame other bland, white-fleshed species like cod and seabass. Our fried milkfish had a dense flesh which carried a slightly acidic tang with a mild, tart taste of yogurt. The rich and heady aroma of the fish, coupled with the seasonings used, made it another highlight of our dinner. These fabulous dishes fed the five us until we were busting at the seams, but only totaled a little over $30. What a paltry sum for such an enjoyable journey through the food of the Philippines from an unassuming family restaurant in Artesia.